My daughter received her first duplo set. 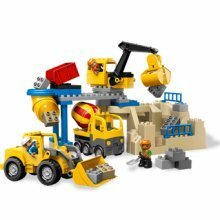 It's a construction quarry set. I picked this set out because of the cement mixer and the dump truck. My kid loves construction vehicles, especially cement mixers. Well boy howdy, this toy rocks the big R.
On day 1 she played with it for 3 hours back and forth. She even played with it through her supper. She ate all her chicken and happily played with her duplos. I was able to get bedtime ready and the bath without juggling and multi-tasking. I even had to pry her away from the quarry for bathtime and she is a bath lover. TG: I want to play. PG: You can play but not now. It's bath time. If we don't take a bath now, we won't have time for storytime. Tomorrow we can play some more. Flash forward to to this morning and the first thing she said after Good morning and her usual I have to potty was, "I want to play now. Can I go play?" PG: Ok. Do you want mama's milk first? TG: No thanks. I want to play. She beelined to her quarry and has been busy since. I may be able to make breakfast without interruptions. Oh by the way for folks who don't know already, Mega Blocks blow. I was never a Mega Blocks fan but she received her first set when she was 1 and then another set from her Dad for Christmas. They don't fit well and don't hold together. Spend the extra money and get the Duplos. They are so worth the money.